Women are possibly the most represented subjects within the walls of museums. But, what about the women who are artists themselves? Though female artists make up more than half of the population, they are represented in approximately 5% of museums’ collections. Visit the Forsyth Galleries to explore the relationship of women to their work, as artists and as subjects in art. 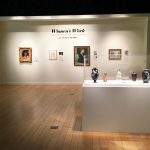 This exhibition will feature selected works from both the Runyon permanent collection, as well as works from University Art Galleries’ collections at large. Join us in exploring the roles women play as both subject and maker through paintings, works on paper, and glass. 5–7 p.m.; Curator’s Tour at 5:30 p.m.
Visit this come-and-go reception to view the Women’s Work exhibition before it closes, and take a tour with our curator at 5:30 p.m. to learn about the women in our collections – both as subjects and as artists. We’ll also play games, give away prizes, and enjoy refreshments.